Cupcakes became popular by leaps and bounds over the past few years. From merely being one sweet and tasty snack or dessert, it has evolved in such a delicious way that it has now become a staple in children’s birthday parties as part of the birthday feast or treats or as a one delectable giveaway or souvenir. Recently, cupcakes have evolved further with the birth of personalized cuppies. Now anyone can choose a favorite design, be it a favorite cartoon character or a favorite video game character, or perhaps a name or a military challenge coin, signifying a birthday celebrant’s regiment. Imagination is the only limit to how you can make a simple cupcake as personalized as you want it to be. 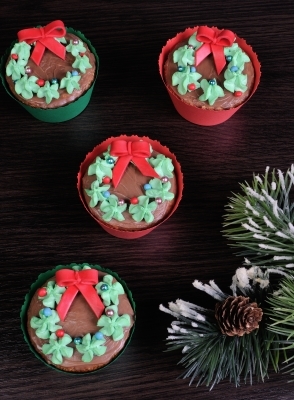 So to make this year’s Christmas gift-giving even more exciting, it is time to put your cupcake-making skills into practice and make a few batches of this wonderful treat as gifts. This entry was posted in Holiday Food, Occasion and tagged gift ideas, personalized cupcakes, personalized gifts, what to cook for christmas, what to prepare for christmas on December 21, 2015 by Yami.